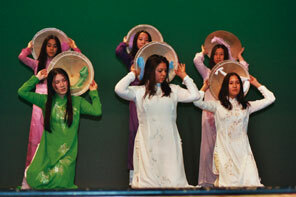 Vietnamese Club members perform a traditional vietnamese Hat Dance in Blair's International Show. Hispanic Club members perform a popular Latin Dance. Every year Blair has a special program of international talent. The show is known as The International Show. The 2005 International Show was held on Friday March 18 at the Blair auditorium. This program gave opportunities to many students to represent their countries, cultures and their talent. There were nine clubs involved in the show this year. There were also some groups of independent students that participated in the show and did not belong to any group. The show was sponsored by Ms. Bohórquez, an ESOL teacher. The Mistresses of the show were two ESOL teachers, Ms. Tomesek and Ms. Honerkamp. The show was open to anyone who wanted to attend. The cost of the show was $3 per person. This year the show raised about $1,400. Some of the money is going to be donated to Silver International. According to Ms. Tomesek this year the production staff was concerned about not having enough people watching. “We were worried that people were not going to come see the show,” she said. “We waited for ten minutes to start the show and after a while people started coming and filling in the chairs,” she added. According to Ms. Bohórquez most of the people who participated in the show were international students. “There were more international students than American,” she said. Every year the same clubs participate in the show and this year she wanted everyone to participate and make the show even better. She believes that anyone can do it to show how Blair is more diverse. Many parents, teachers, and students came to enjoy the show. Teachers and students had good compliments about the International Show. “I really like the Middle East and the Chinese Clubs. They were amazing,” said Princess Momo. 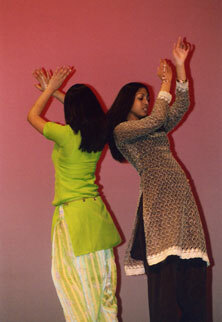 Ramona and Saba from Indian Club perform a traditional Punjabi dance. Etihiopian Club members perform a traditional dance called "Oromega." 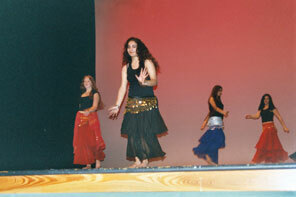 Middle Eastern Dance Club members perform the belly dance. 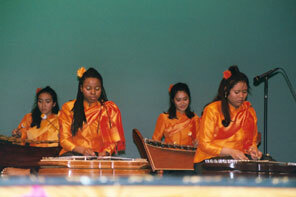 Cambodian Club members perform a song called "star in the sky" using traditional musical instruments.